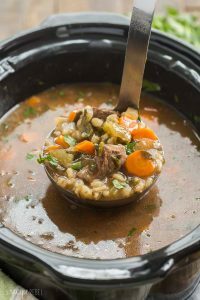 This Slow Cooker Beef Barley Soup is an easy crockpot meal perfect for fall or winter! Loaded with vegetables and tender chunks of beef. Includes step by step recipe video. 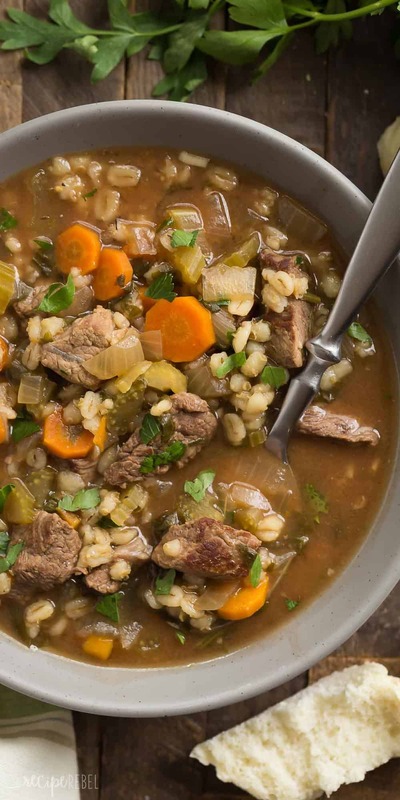 There is just nothing better for cold weather comfort food than this Slow Cooker Beef Barley Soup, you guys. I love soup, but my kids hate it. I’m honestly not sure why, exactly. I guess everything is cooked in one pot and all mixed together, but that’s nothing different than any of the one pot meals I make on a regular basis. The hubs and I have started a Slow Cooker Sunday tradition, where we put a batch of soup on high in the slow cooker in the morning while we’re away at church, and then we actually get to eat a nice lunch together instead of reheating whatever we can find buried in the back of the fridge. It’s been a welcome change, especially when the weather is frigid and snowy like it has been lately! I honestly don’t have a favorite soup, but I do have a few requirements for what makes a Good Soup. It has to be thicky and chunky. Loads of vegetables, pasta, rice or barley. None of this thin, watered down stuff that will leave you hungry an hour later! It has to be BIG on flavour. Browning the beed before adding it to the slow cooker adds a ton of it, and I also prefer the texture after cooking as well. I find that it doesn’t disintegrate and get that weird been-cooking-all-day texture like meat often can in the crock pot. It has to be relatively healthy. Because soup is a great place to hide veggies, and I know you know I’m not a big fan of them raw. I will throw anything in soup, because in the end, it all cooks down and takes on the same flavours. It’s an awesome way to get some good stuff in those picky eaters! Normally, I’m not about adding extra steps to recipes. But in this case, I decided to brown my meat before adding it because it seals in the juices and I think you end up with a better texture to the meat after cooking for so long. It also adds extra flavour to the soup! You can definitely skip this step and throw it in without browning and save yourself an extra step. 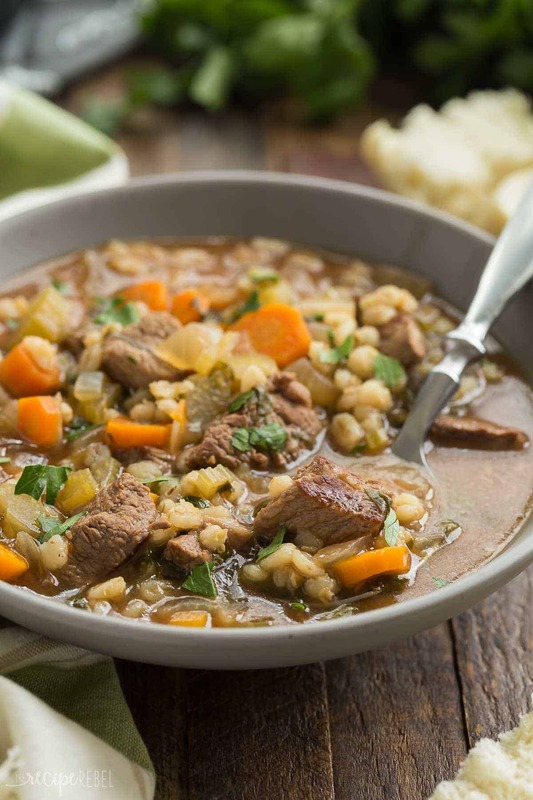 You can mix up the veggies here to suit your family’s tastes: I added spinach, which is a little untraditional in beef barley soup but I love it because you don’t even notice it. You can take it out or add in other favorites: peppers, mushrooms, kale, or throw in frozen peas or corn before serving. Sometimes slow cooker recipes can lack a little “oomph” by the end of cooking time — they are a little bland. By adding in a small amount of balsamic vinegar and some fresh parsley at the end, you really punch up the flavor! I definitely wouldn’t recommend skipping that step. OPTIONAL: In a large skillet, brown meat in oil over high heat. Add to a 4-6 quart slow cooker. Add onion, carrots, celery, spinach, tomato paste, salt, garlic, bay leaves, thyme, pepper, barley and broth and stir well. Cover and cook on low for 6-8 hours, or on high for 3-4 hours, until vegetables and barley are tender. Stir in balsamic vinegar and parsley and season to taste. Serve. All my store had was quick barley. Should I still put it in or wait till closer to the end or just cook on stovetop and then put in?? I would maybe leave it until half way through the cook time, or the last few hours. I was wondering how big a serving is??? One serving is 1/8 of the recipe. Unfortunately I don’t know the weight or volume. Does the barley get mushy from being in for so long? Wow what a hearty soup it’s not my version but this was awesome I used green beans instead of spinach, my husband hates spinach and the balsamic vinegar was the icing on the cake. I use rice wine vinegar in my homemade chicken noodle soup. Thanks for this recipe! Why does video show onion but recipe doesn’t have onion? Love this soup! So easy to make and extremely tasty! hahaha! I love the improvisation! I’m so sorry! Do you mean the recipe box isn’t displaying? Thanks Betty! I hope you enjoy it! Thanks Sarah! I love a good hearty soup too!